Kentucky Fried Chicken doesn't have a reputation for healthy food. When the second word of your name is "fried", it's hard to make a claim that you have healthy goodness in mind. Doesn't matter if you're using all-natural corn, safflower, peanut or walnut oil, you're still frying the food. Last week, I had to attend a meeting and I wasn't able to get lunch before it. There used to be an Arby's near the meeting site, but that closed 9 months ago. There is a Subway, but I didn't want a deli sandwich. I went to KFC. They have popcorn chicken, which I like, and I can get baked beans as my side. Their baked beans have a flavor I enjoy. If you've not been to a KFC lately, they have started something new. All their sides come in these little, single serving-size containers. 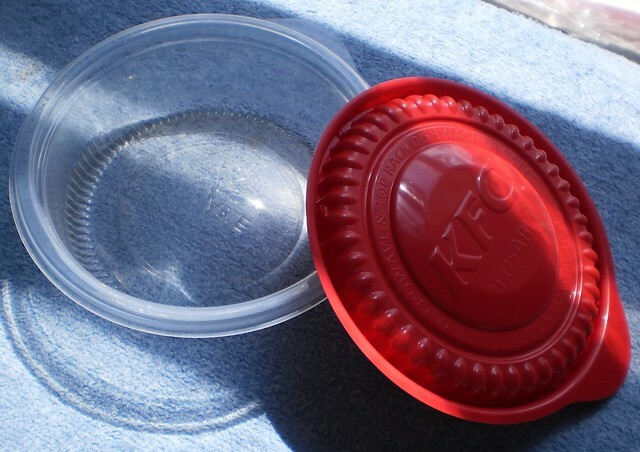 The idea is that the containers are recyclable which should, in theory, reduce waste. In practice, I don't see this as reducing the waste stream all that much because there isn't a place to recycle them if you don't want them. They just get chucked into the garbage along with everything else and they are made of plastic which is made from oil. But, for someone like me, this is a nifty idea. As you can see, I brought mine home and washed it out. The size is great. I can fill it with just enough salad or jello or pudding to go with a meal. It would also be great for raisins, sunflower seeds, grapes, shredded cheese, diced chicken, veggie dip, I could go on, but you get the idea. Eating KFC isn't something I should do regularly. The job for which I had the meeting is starting up in earnest this coming week. I'll be in the neighborhood of this restaurant a lot over the next 3 weeks. I should amass a nice collection of these containers by the time the job is over.